One technique I haven't used much when painting is painting miniatures using only washes. I tried the technique on some Imps from Impact Miniatures that I plan on using in a custom variant of Blitz Bowl. 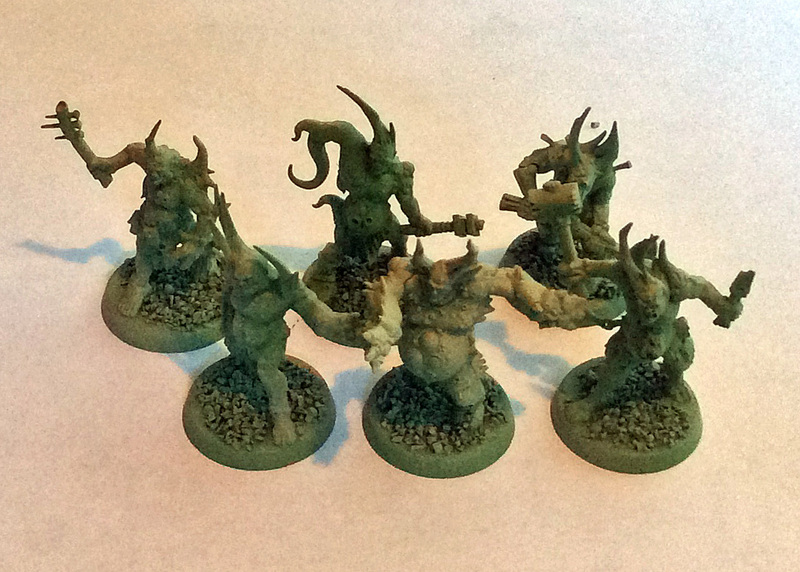 I first primed the Imps white. I then shaded their skin with a yellow wash, then washed the skin with a green wash once that was dry. The red and purple areas were first washed, then hit with a coat of Vallejo paint when the wash colors weren't saturated enough for my tastes. I finally hit the silver parts with a metallic Sharpie marker. So... it ended up that I did not only painting them with washes, but with a mixture of techniques instead. After seven seasons and sixty-seven episodes of Game of Thrones, only a half a dozen episodes remain. Tomorrow is the start of the final season and the beginning to the end of the epic story. I started reading A Game of Thrones after my friends and I first played Fantasy Flight Games' boardgame in the mid-2000s. I read the first few books and became very excited after it was rumored that HBO was pursuing the rights to the series. I distinctly remember talking about that possibility with my manager over dinner one night in California, after a company training. He was also reading the series. The first season of Game of Thrones aired in 2011 and I remember that early that season my mother called us interrupting a Sunday episode, and asked us to turn on the television. It was May 1, 2011, and President Obama had just announced the raid that killed Osama Bin Laden. My dad and I are always trying out new games in our father-son weekends that occur every few months. 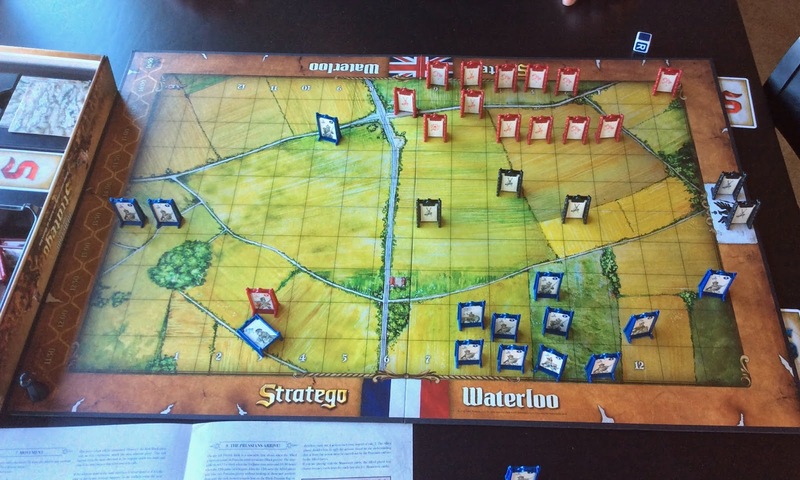 In our last one, we decided to unwrap and play Stratego Waterloo, which recreates the Battle of Waterloo, fought way back on Sunday, 18 June 1815. On that day, the French army under the command of Napoleon Bonaparte was defeated by a British-led allied army under the command of the Duke of Wellington and a Prussian army under the command of Field Marshal Blücher. 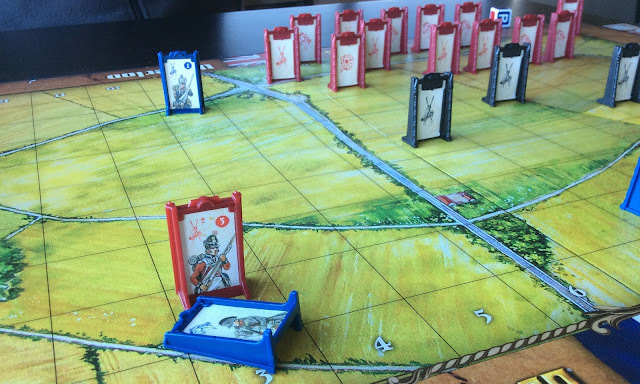 Playing the original Stratego against my dad is one of my first memories of playing boardgames, and I was excited to try this version and refight the Battle of Waterloo. I played Emperor Napoleon, and my dad took the Duke of Wellington. 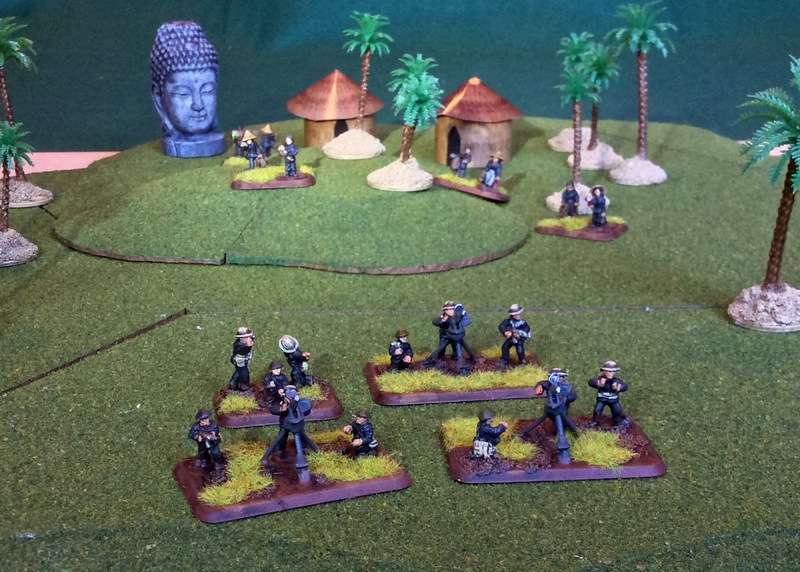 The winner in this version of the game is the first player that succeeds in severing the lines of retreat of the opposite player (occupying the flank of the opponent). The game is also lost if a player loses his commander and commander in chief. The French took a heavy toll on the British early game, but once the Prussians entered the fray, the artillery of the French was quickly destroyed in flanking maneuvers. Cavalry succeeded on both sides winnowing down opposing forces. In the end, Napoleon was hunted down and defeated by an elite English infantry unit, and the battle was lost for the French. 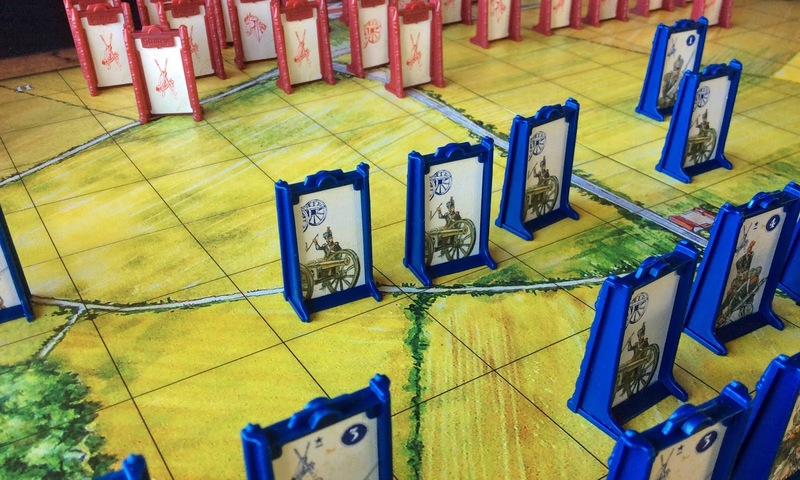 Stratego Waterloo is a light wargame, but more heavy than the original Stratego. You definitely experience the give and take feel of the lines of battle and your use of cavalry to make thrusts into the enemy lines is a key factor in success. 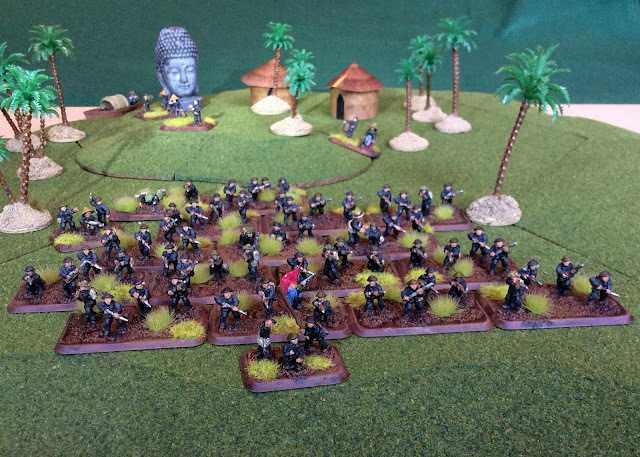 The French made good use of its cavalry early game, but once the Prussians entered the battle, it turned the tide of battle. Vive La France! 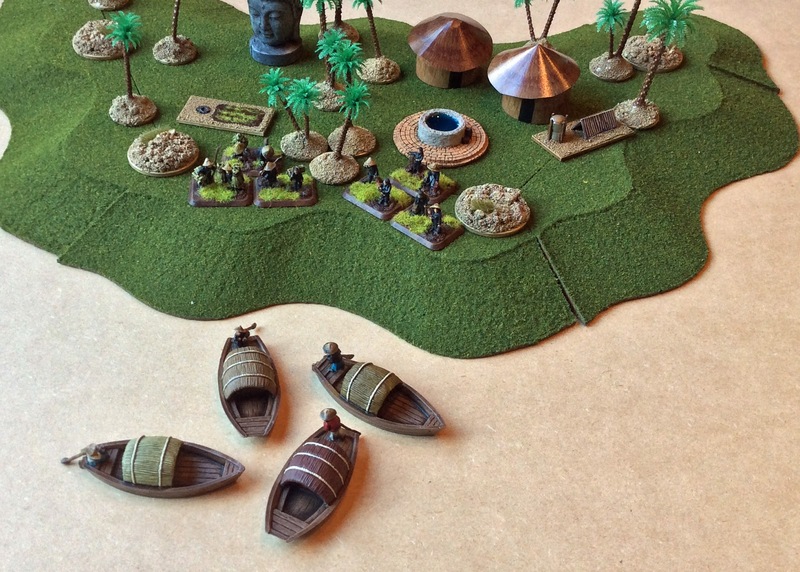 Lately, over the last few gamenights we have been playing Axis & Allies Naval Miniatures. The game was produced by Wizards of the Coast as a sister product to its Axis & Allies Miniatures game, (which we have never played). The game has a simple (but strategic) gameplay, and a typical game can be completed in under an hour. 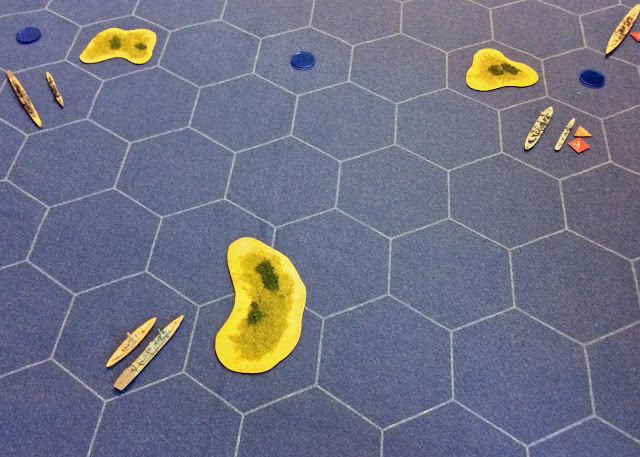 In the game, players can takes command of ships and squadrons of aircraft. The ships run the range from aircraft carriers and battleships, to cruisers, to destroyers, to submarines, to auxiliary ships and even motor torpedo boats. I have a few other ships from various other fleets, including a German contingent that includes the Bismark and the Prinz Eugen. I also have a small British fleet, and a contingent of smaller nations (like Poland). The biggest issue now is that the game was released in 2007, but only lasted with official releases until 2011. This means obtaining the models at reasonable prices can be hard. 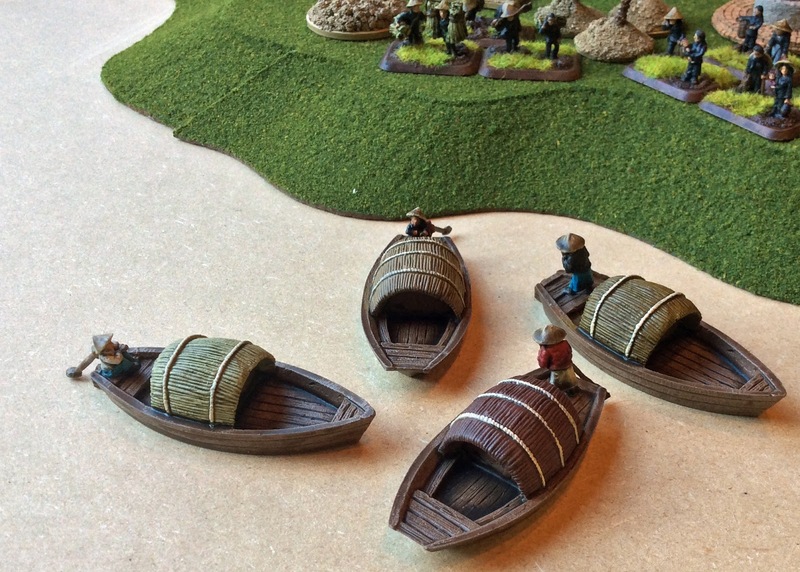 The others in our group have bought some of the more inexpensive offerings from Ebay and other online dealers and inherited some of our more least-played fleets. After successfully trying out a four player 'Crossroads' game for Blitz Bowl a few months back, we decided next to use some old Warhammer Quest tiles and some Frostgrave chests to play a five player Dungeon Bowl game. 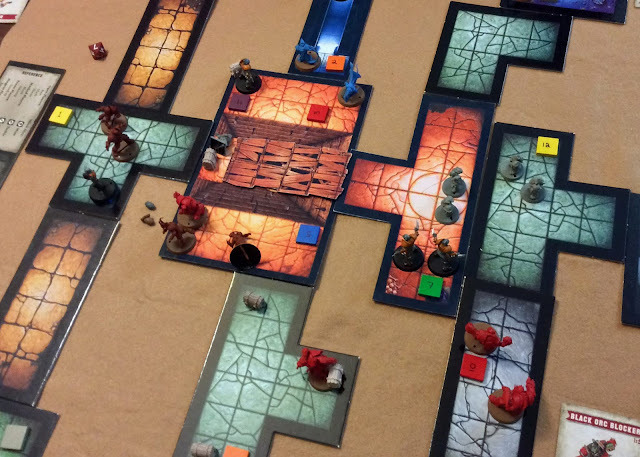 The first part of the game was each team searching for the ball hidden in one of the trapped chests scattered throughout the dungeon. Unfortunately, we quickly realized that the game wasn't working well. The high number of players we had selected and the small width of the corridors made movement difficult, even with the teleporters. So Dungeon Bowl using Blitz Bowl rules was a bust, but I'm still glad we tried it out. It makes me more excited for future regular games of Blitz Bowl, as well as curious to try out other multiplayer variants. I'm considering making a custom three player mat in the near future. After almost four years of working on them off and on, this weekend I finally completed my Viet Cong Local Forces Infantry Battalion for Flames of War: 'Nam. 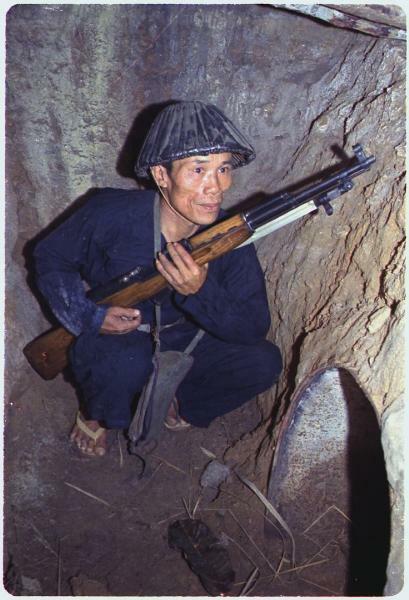 Since I started the force, the new 'Nam book was released which changed some options. I custom created a sniper model that can't be used, and a few of the command stands are no longer needed. In all, with off-table artillery and Guerilla Booby Traps, I can assemble just over 50 points under the new rules. 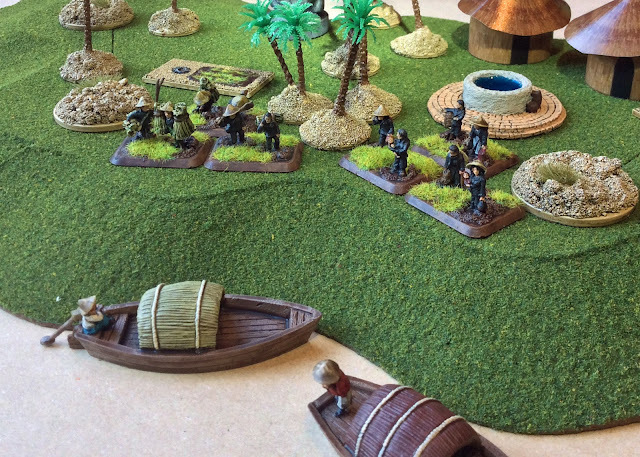 I built the machine gun nests out of toothpicks and greenstuff, but most of the miniatures are a mix of Battlefront's miniatures and the Viet Minh offerings from Eureka Miniatures. 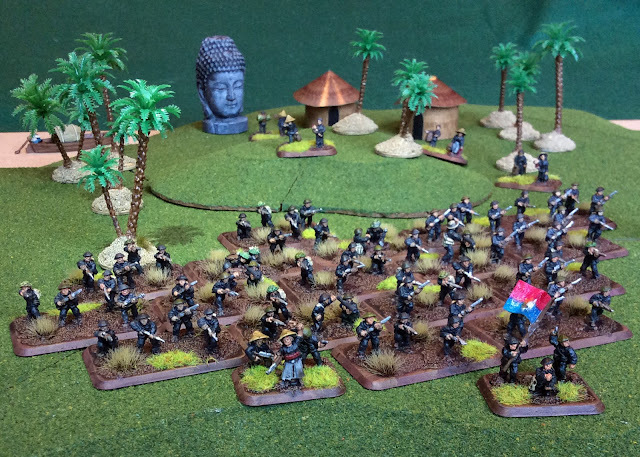 Although the Viet Minh miniatures are not ideal for this time period, I found that they sized better for the 15mm scale look I was going for, and they mix in with Battlefront's official miniatures well enough. The Eureka miniatures are more based on the traditional pith helmet, and I wanted to go more with the look in this photo, as opposed to the conical leaf hat so predominately featured in Battlefront miniatures. Looking forward to putting on some Creedence and getting in a game soon. I'm also hoping to be able to leverage some of the miniatures for some 15mm Superhero gaming, perhaps in a time-travel capacity. 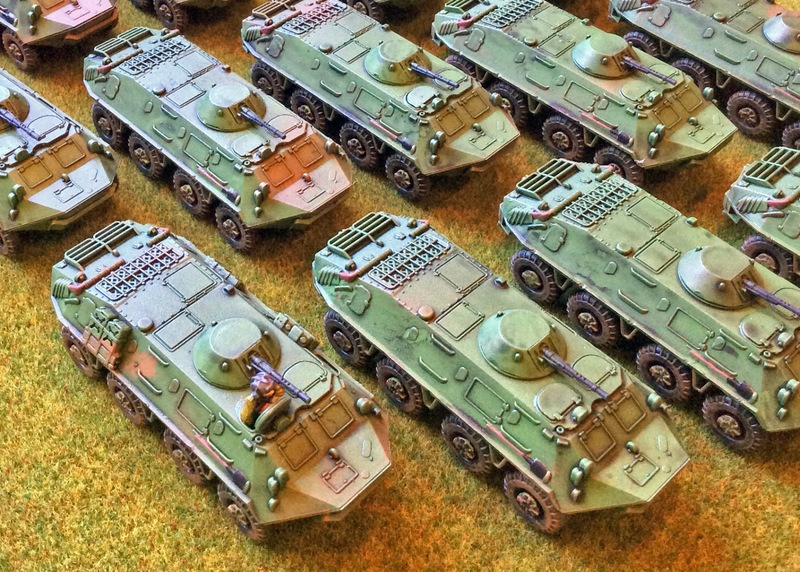 As we have been playing Warhammer 40,000: Killteam, I have been attempting to speed paint a number of small forces to try out with the game. Before this latest attempt, I painted a squad of three Chaos Marines with some Sharpies a little while ago. 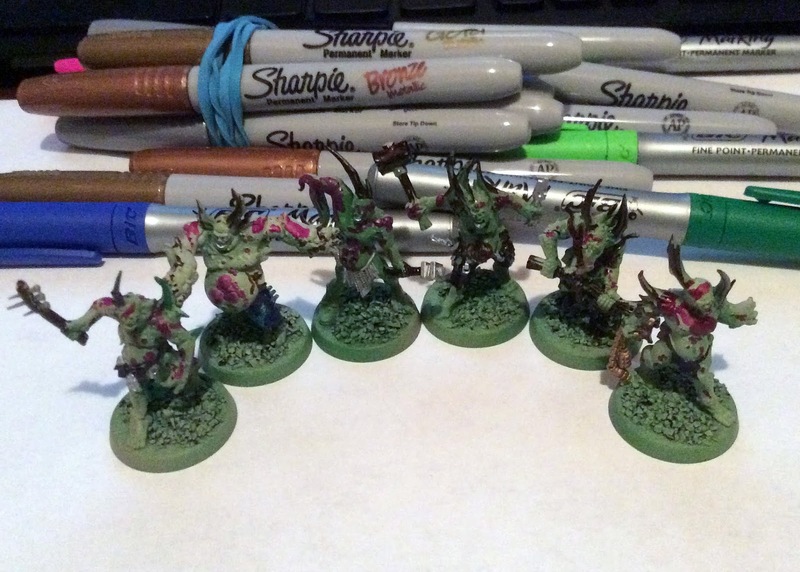 One of my most recent attempts has been to paint some Poxwalkers, using Army Painter color primer and Sharpie pens. After priming them green, (with a zenithal overprime of a lighter green primer), I used Sharpies before dipping them using Royal Walnut Satin Mixwax Polyshade. I used normal acrylics to paint the the bases and added some flocked foliage to complete the models. I used a silver Sharpie for the eyes which turned out looking great. 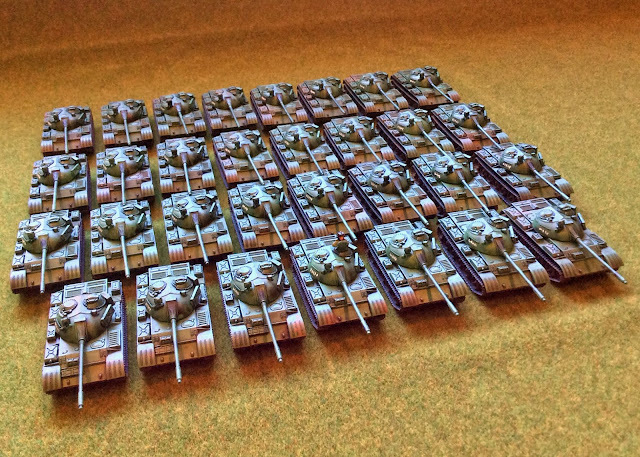 In all, they turned out alright, and the approach did save some time over painting them with acrylics. 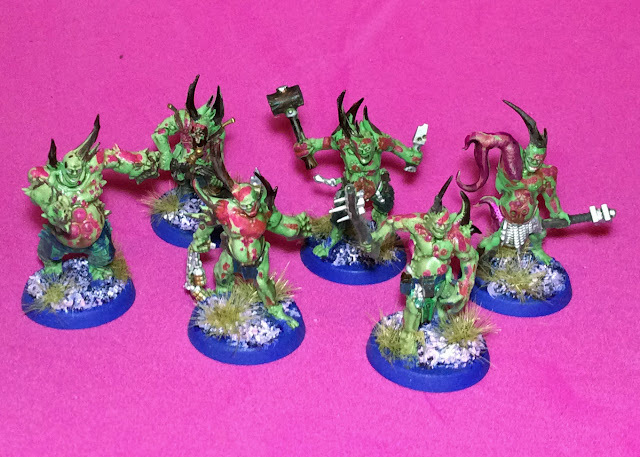 Because the model are Nurgle, the dipping method definitely worked better than it would have on other types of models, where a more clean look is appropriate. 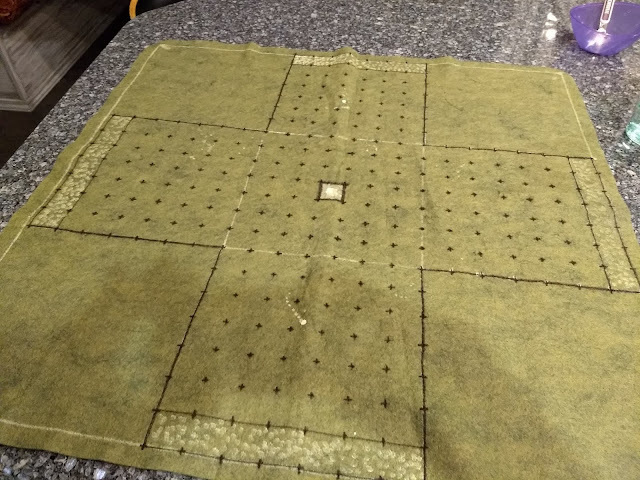 I completed a custom four player "Crossroads" pitch for Blitz Bowl games before the holidays. It was made from some felt from JOANN Fabrics and Crafts and a black Sharpie pen, (I tried to use a white fabric marker, but it went dry much too easily and had to switch to the Sharpie early on). Over the holidays we played a few four-player games on it and have had a great time each time we have played. In the center, we placed a single statue of Nuffle, which also throws out the balls at the start of the game (and whenever a touchdown is scored). Our first game was Skaven vs. Chaos vs. Orcs vs. Dwarfs. The Skaven scored on the second turn (due to their 9 Move), but in the end the Chaos pulled off two touchdowns with some smash and grabs. Scoring is hard, but if you are opportunistic, can happen fast, just like in the standard game. 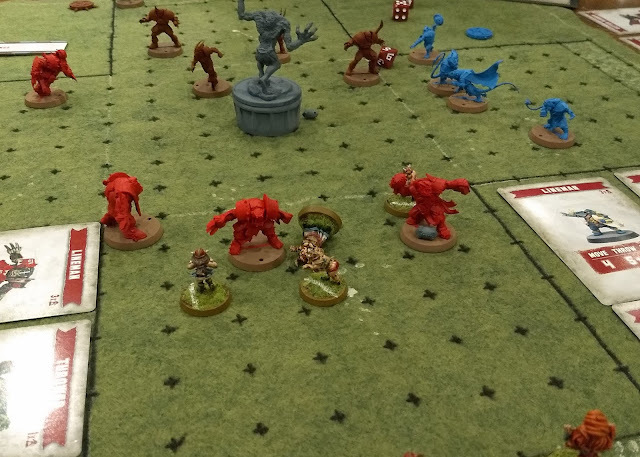 All teams scored at least one TD, except for the Orcs, (they were too busy smashing, and rolled terribly most of the game). For our second game, we played Elves vs. Orcs vs. Chaos vs. Goblins. This game was fast - just 30 minutes. 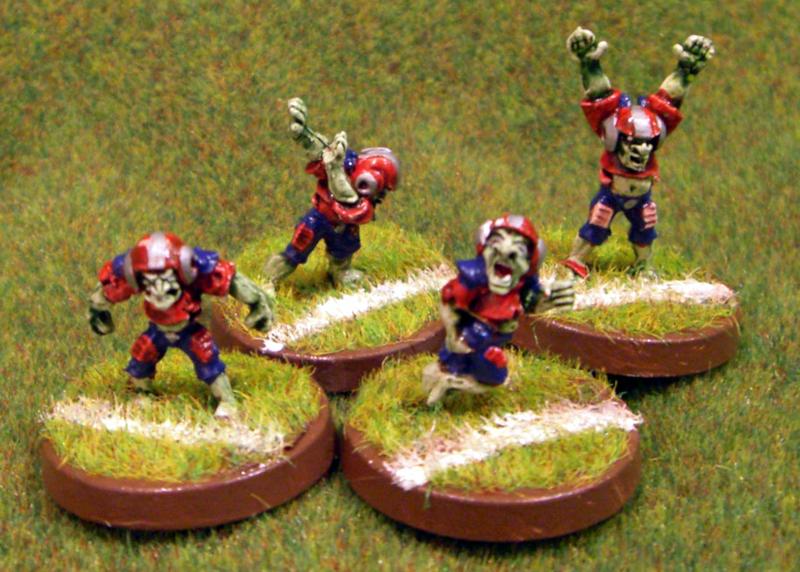 The Goblins won this time, and again, all teams but one scored at least one touchdown. 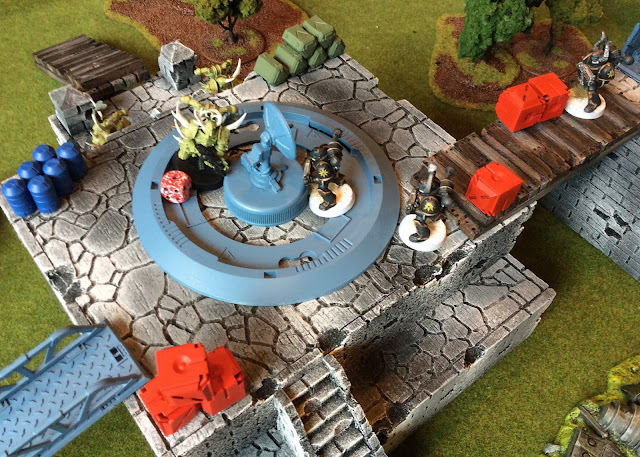 We are looking forward to additional games, and perhaps using some Warhammer Quest tiles to play a version of Dungeon Bowl using the Blitz Bowl mechanics. Over the recent break we had a chance to play a small, three-player, fifty-point game of Warhammer 40,000: Kill Team. There was a Nurgle force, a Chaos Space Marine force, and I played a Necron force. The Nurgle force was comprised of all Nurgle Marines, the Chaos Space Marines included three Chaos Marines and two cultists (one with a Heavy Stubber who stayed back all game), and the Necrons included just three Immortals. 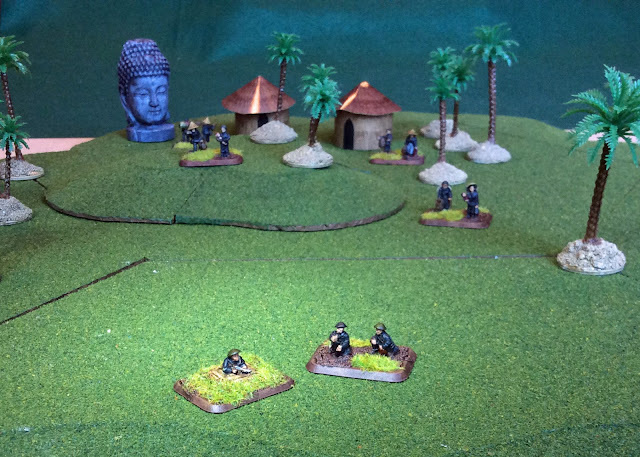 The game featured a high-elevation objective, which awarded ten points per turn that it was held unchallenged. 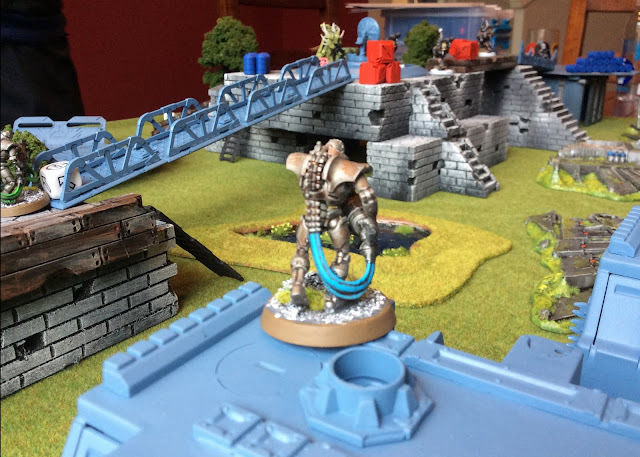 There were a number of avenues to approach the objective, and Nurgle made a mad dash to the objective, while the Necrons and Chaos Marines tried to shoot them from afar (with little effect). 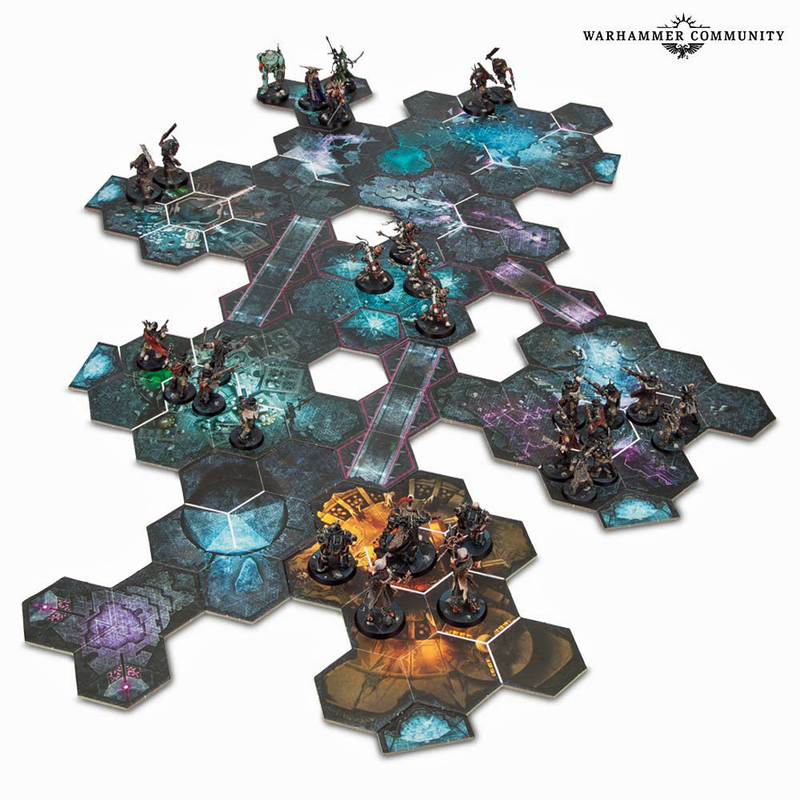 By mid-game, every force had all assembled near the center objective, and the game turned into a massive, multi-team melee. In the end, the massive melee turned into a boring roll-fest. The three forces were so strong on defense and so weak on offense that the rolling went on several turns without one casualty. 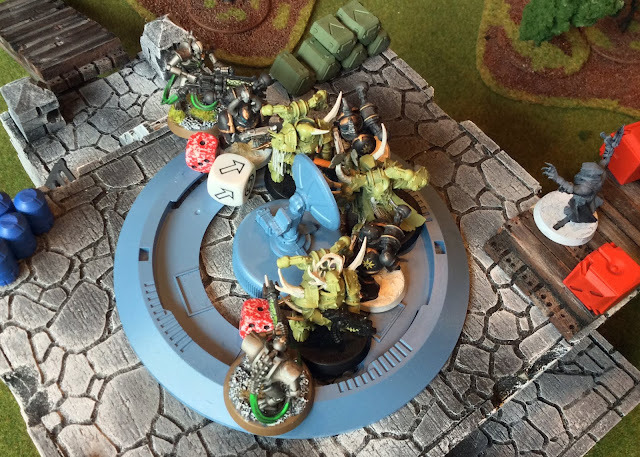 The Nurgle force eventually dominated close combat (thanks to their extreme durability and plague weapons) and won the game by defeating a few Chaos Marines, thereby reaching fifty points to achieve victory. Although a fun learning game, we decided that next game we would likely change the objective placement and win conditions. 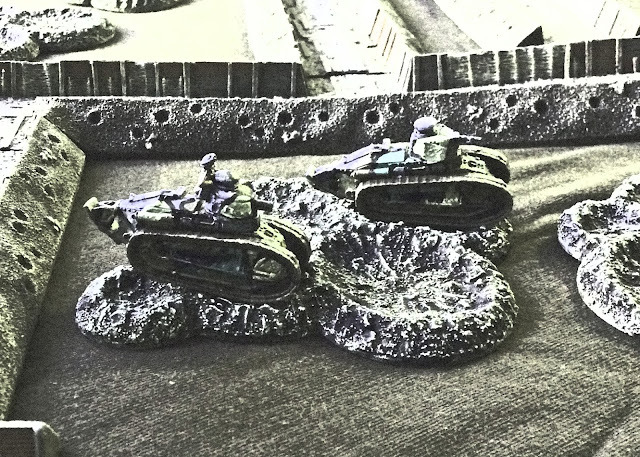 We also decided that each team would have benefited from bringing a few more special and heavy weapons into the battle. 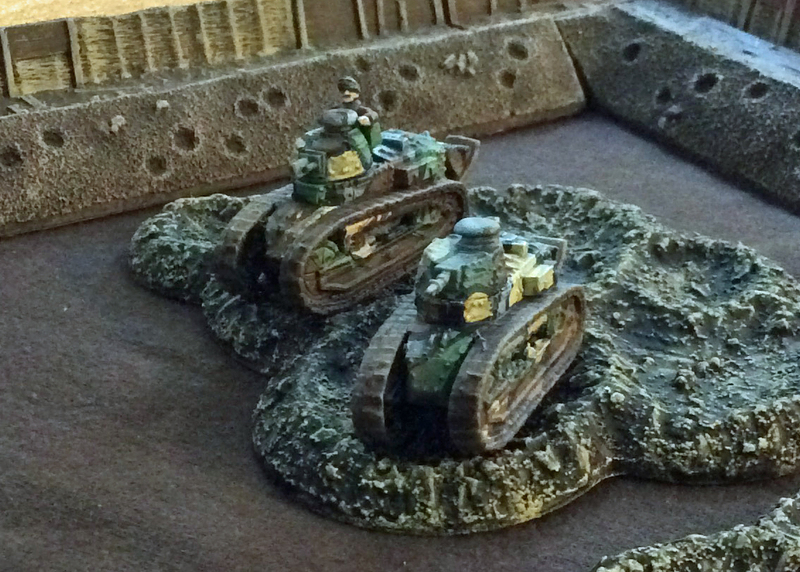 We look forward to future battles using our Kill Team forces! 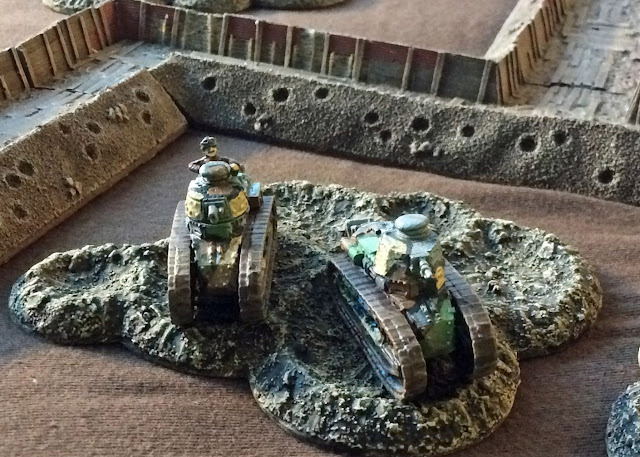 Over the last few weeks we have been been painting up models for Blitz Bowl, while also getting more than a few plays of it in. We have all found Blitz Bowl to be a great two-player game - very different from Blood Bowl, but enjoyable in a very unique way. It is fast to play, provides a ton of strategy and choices, and the game provides additional team cards (apart from the Humans and Orcs) that allow you to use additional teams. 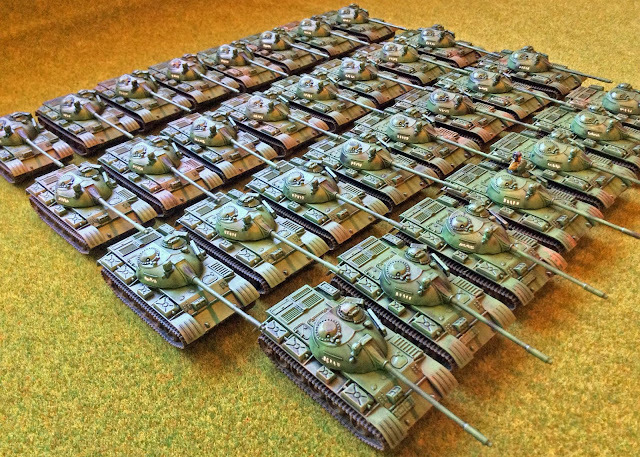 This was a great choice by Games Workshop and makes the game extensible with additional models, providing much more variety in match-ups. The Challenge Cards are what make the game shine; they provide randomness and enhance the flavor of the game by taking some of the focus off of just scoring touchdowns. 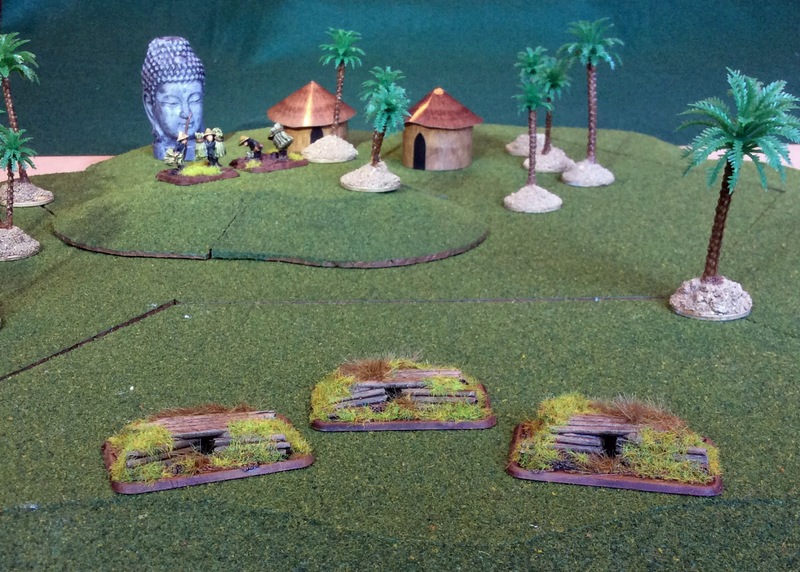 We have models for most of the teams now and it seems that they are all mostly balanced for our style of play. If we had to pick a weaker team, it would appear to be the Elves. 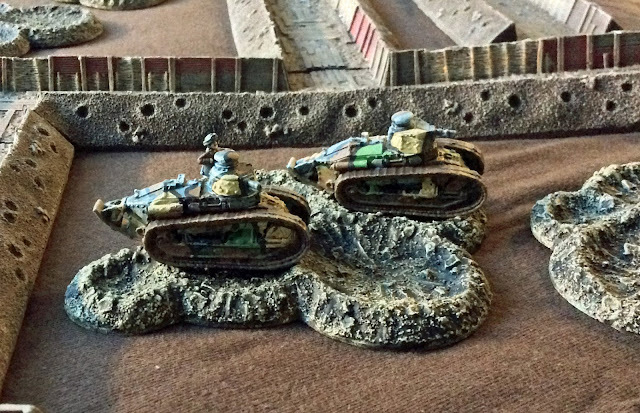 Although good at passing, they have a really poor armor stat and are not as fast as the Skaven. This could just be our own experience because we haven't seen a lot of passing in our games. All of the other teams seem to have useful benefits that make them more or less competitive. I've only fully painted up one full team so far (my female Dwarfs), but I'm hoping to paint up the Humans soon. We are also hoping to get a few more games in, (including some four-player games using a custom pitch I created). 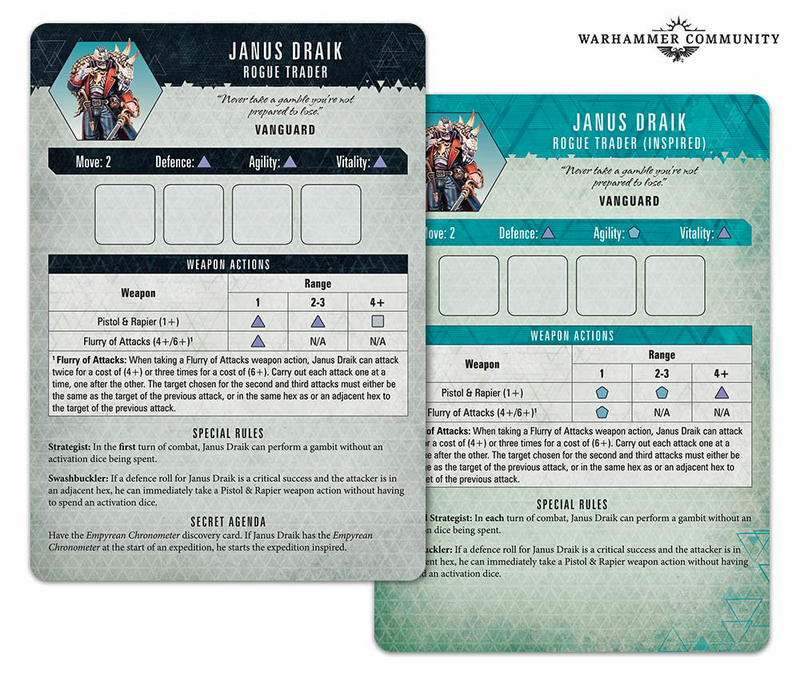 If you are interested, there is additional information about the game on the Warhammer Community website, including a Watch It Played video explaining the rules. Blitz Bowl is available only from Barnes and Noble and is well worth its price of $44.95. This time we didn't place a turret in the middle of the board like our last game as we wanted to encourage more interaction in the center. I played Ballbreaker, a truck with front facing ram and two loadouts of grenades. 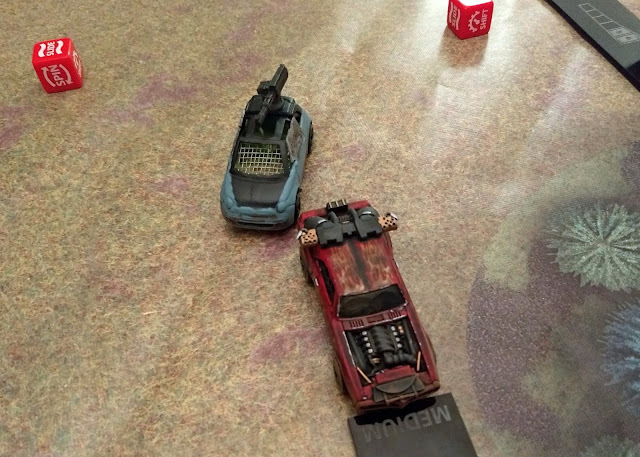 I took a ton of damage early from Hell Camino, but got my revenge with a Hard turn where I rammed it head-on. We both took a ton of damage from the ram. I was destroyed the next turn and exploded, (which worked out well as I was hosting and needed to head out to grab dinner). The game was much more dynamic than our first game, with a ton of maneuvering and different types of attacks being made each turn. The buggy was the first to be defeated, and soon after my car, Flameblaster, was destroyed by some rockets fired from Juice's truck, Dinoblaster. It felt like we finally got down the mechanics of the game this time, and it made the game go much faster. 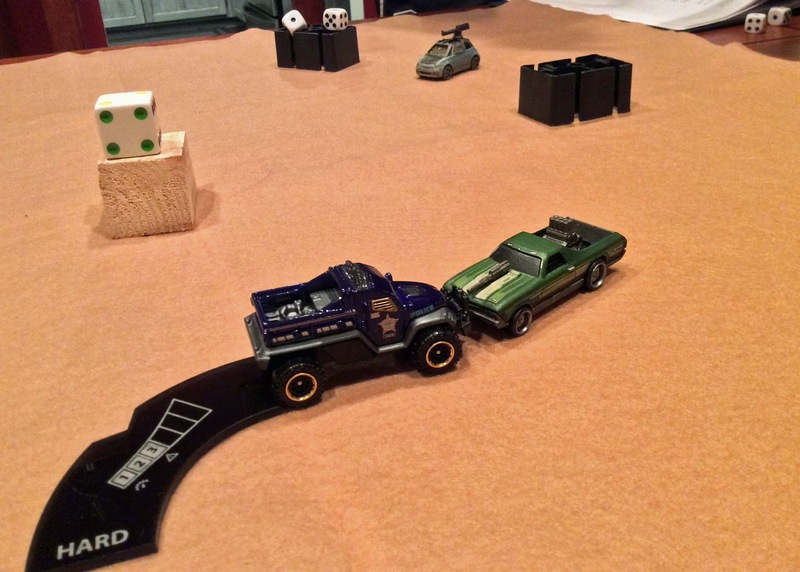 We are looking forward to trying Gaslands a few more times over the upcoming holidays. 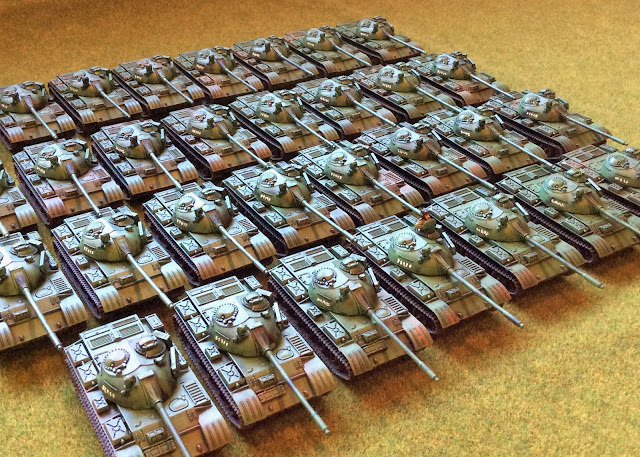 Battlefront released The Great War supplement for Flames of War back in 2014, but I only recently completed painting my two FT-17 tanks for my French "Polish Army in France" army. 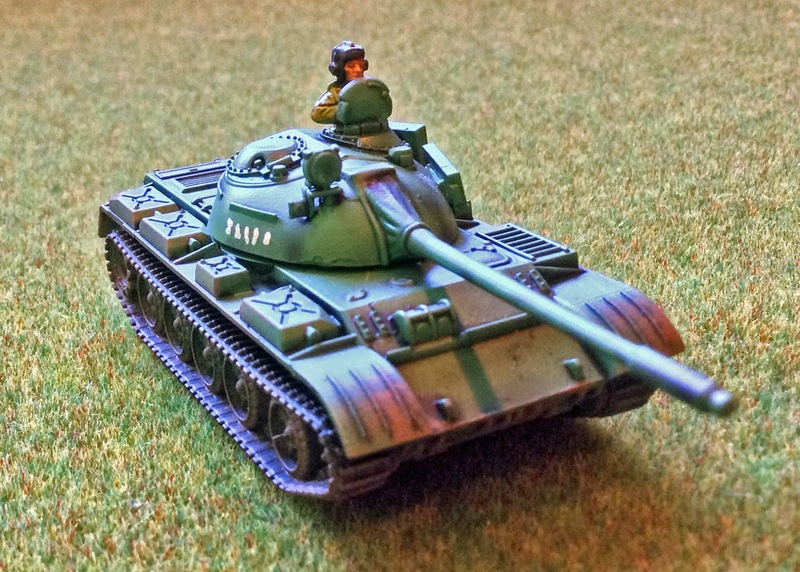 The FT-17 was a French light tank with its armament within a fully rotating turret - many consider it the world's first modern tank. In the spirit of "Tanksgiving", I wanted to post my recently completed T-55s for Team Yankee. There are thirty-one of them in number, including a model to act as a command model. I previously shared my attempts to make a JNA (Yugoslavian) force for Team Yankee (using the rules for the East Germans). The T-55 tanks are from Plastic Soldier Company. In general I prefer Battlefront's plastic tank offerings, but back when I purchased these their plastic T-55s were not yet released. 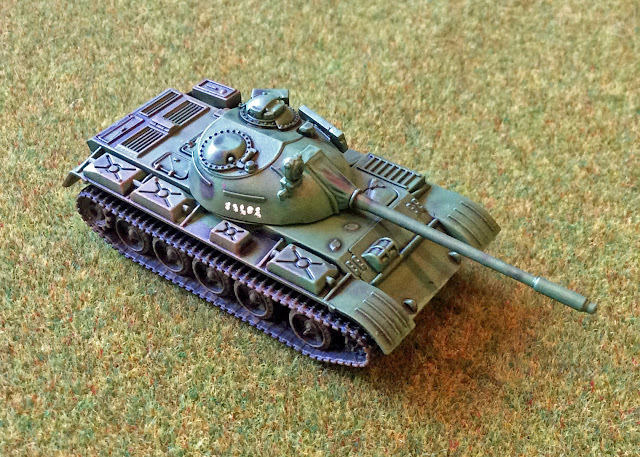 I primed the tanks with Goblin Green from Army Painter, and used Army Painter Dark Tone which greatly muted the bright green. The tracks were first primed with the green, then hit on the top and bottom with black primer. 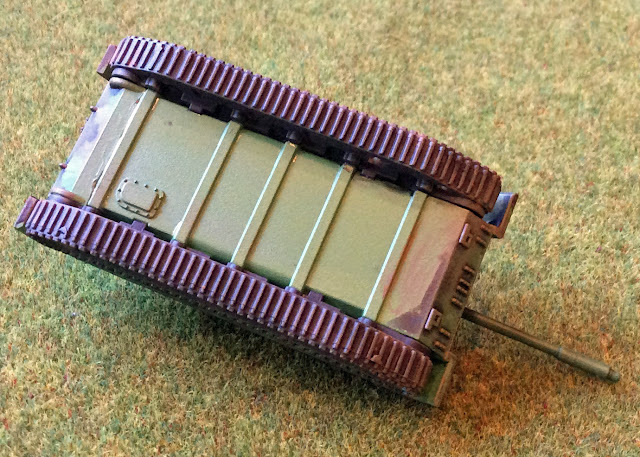 This saved me a ton time by not having to hand-paint the tracks (except for weathering). 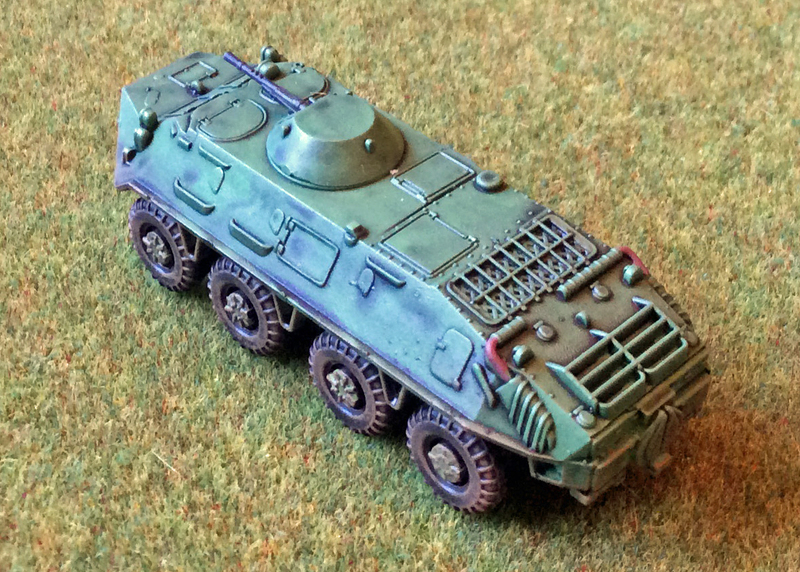 I then painted on the details before lightly drybrushing on dust and dirt using a light brown color. We played our first introductory game of Gaslands on Friday and had a blast. We played a three gate race and the three of us each had a single vehicle costing about 20 cans. 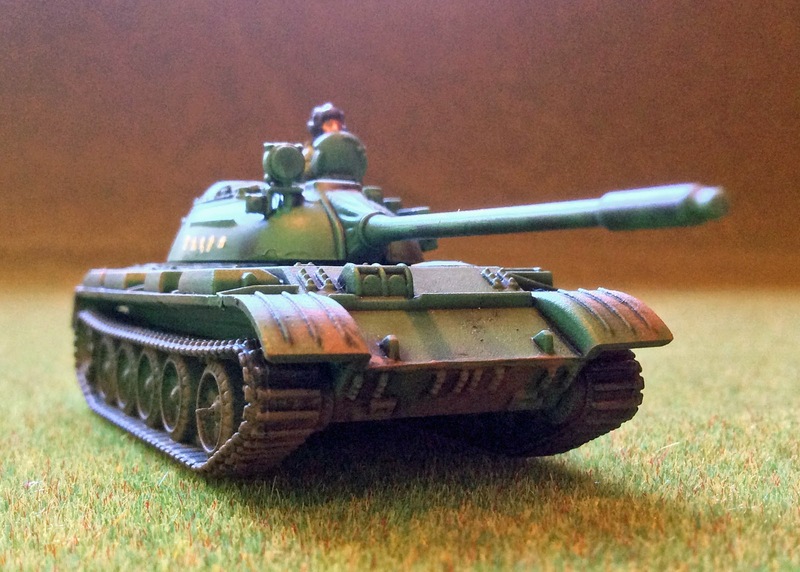 We played on a vinyl mat for Gale Fore Nine's TANKS game that I received as a Black Friday add-on one year, and it seems to have worked well despite being designed for 15mm models. 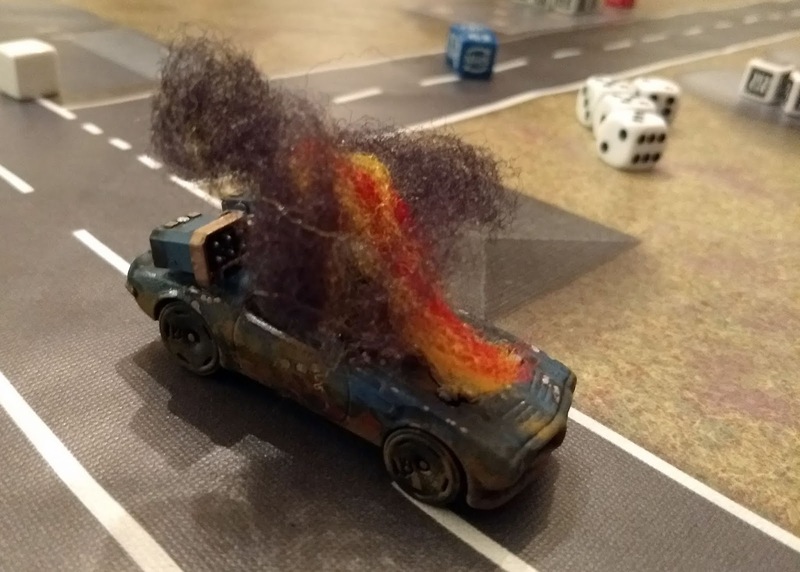 My vehicle, Windburner, did not fare so well. First I did not shift-up in the first activation. Then in over-doing it to catch up, it eventually crashed into a building and wiped-out. In the end, Juice won the race using Flameblaster, barely edging out Roberge's mini-gun-armed buggy. The buggy got a few good shots off, but didn't inflict enough damage before the race ended. It was a fun introductory game and I'm excited to try it again soon with additional vehicles and players. "The eleventh hour, of the eleventh day, of the eleventh month..."
One hundred years ago today, the conflict that would later be known as World War I ended. The armistice was signed at the eleventh hour, of the eleventh day, of the eleventh month in the town of Compiègne, France. The Great War, as it was called as the time, helped define the 20th century, seeing the fall of all the continental European empires, the founding of the Soviet Union, and the spreading of seeds that would become World War II. World War I left over 9 million combatants and over 7 million civilians dead. Today on Veterans Day and Armistice Day, we honor our military veterans, thank those who have served our country... and celebrate peace. Games Workshop Announces "Blackstone Fortress" - 40K Warhammer Quest! Games Workshop recently announced Warhammer Quest: Blackstone Fortress - a 40K version of Warhammer Quest. 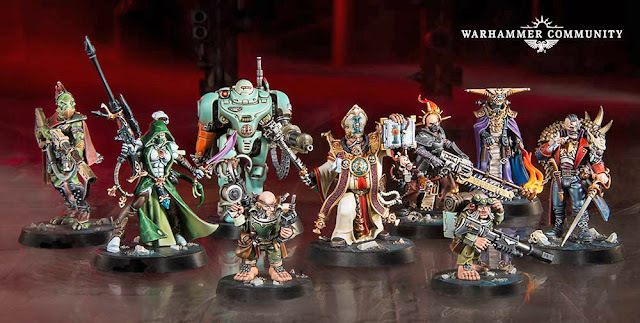 The game will come with eight different explorers for players to choose from, including a robot, a Kroot warrior, a Ratling, and an Eldar warrior, (the others appear to be additional members of the Imperium). Each session of Blackstone Fortress will take two to three hours, and it is played on a hex-based board instead of the squares familiar to the original Warhammer Quest. It will also include D8s, D12s, and D20s in addition to the ubiquitous D6. 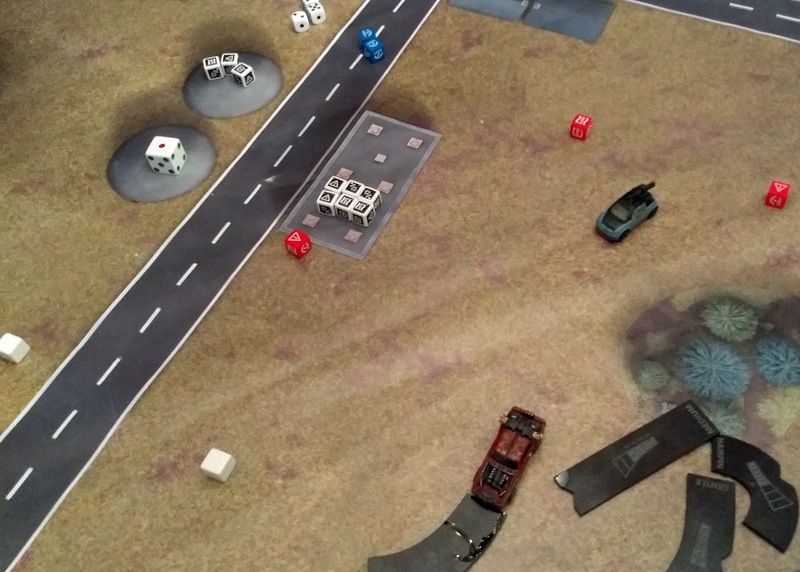 A few years ago, just before Halloween, I led my first 15mm Superhero gaming session. 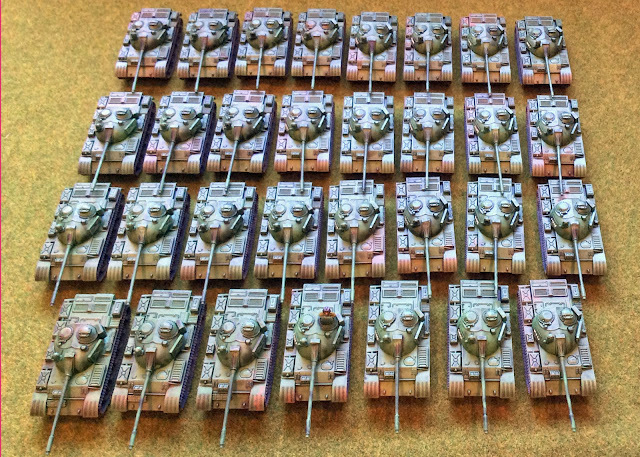 It was called Rise of the Dead and used a number of zombies from Rebel Miniatures. Herr Kürbiskopf has completed his dark ritual in an abandoned church near a small village, raising soldiers from the dead to be his minions. Nick Fury has quickly assembled a small team of new superheroes to confront Herr Kürbiskopf and his undead horde. 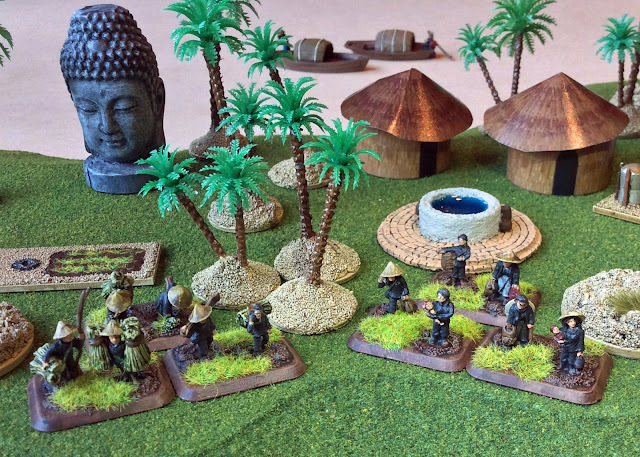 The mission: to protect the villagers, stop the zombies, and defeat Herr Kürbiskopf. Herr Kürbiskopf will return in... "The Dead Rise Again"! 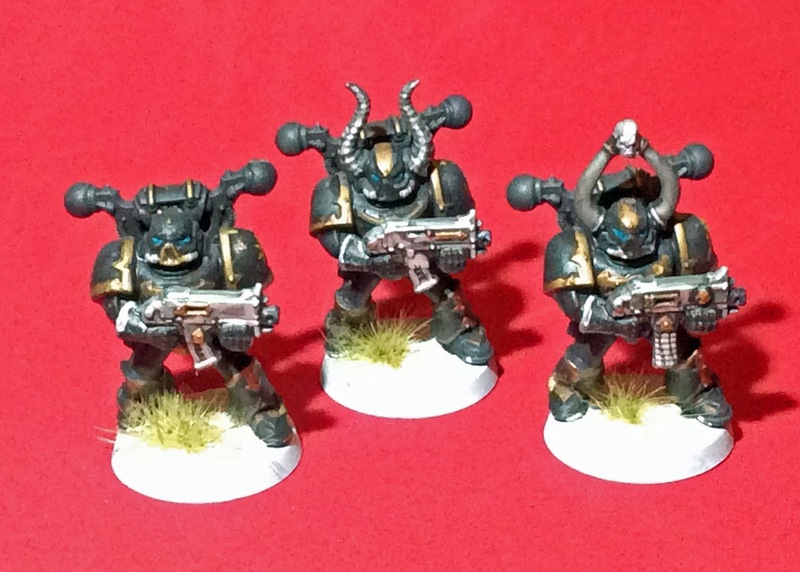 Three 40K Black Legion models have been my latest experiment in speed painting miniatures using Sharpie pens and a limited number of acrylic paints. After painting some Space Marines (Ultramarines) with this method, I decided I would try again with some Chaos Space Marines. The Black Legion worked great with this method as their colors are black and metallic colors. After priming them black, (with a zenithal overprime of dark grey), I used metallic Sharpies to hit their boltguns and armor. Then I dipped them using Tudor Mixwax Polyshade. I used normal acrylics to paint the eyes and the bases, and added some flocked foliage to complete the models. I think the models turned out well for the level of effort involved, and I may be able to use them in smaller skirmish games, like Kill Team, in the future. 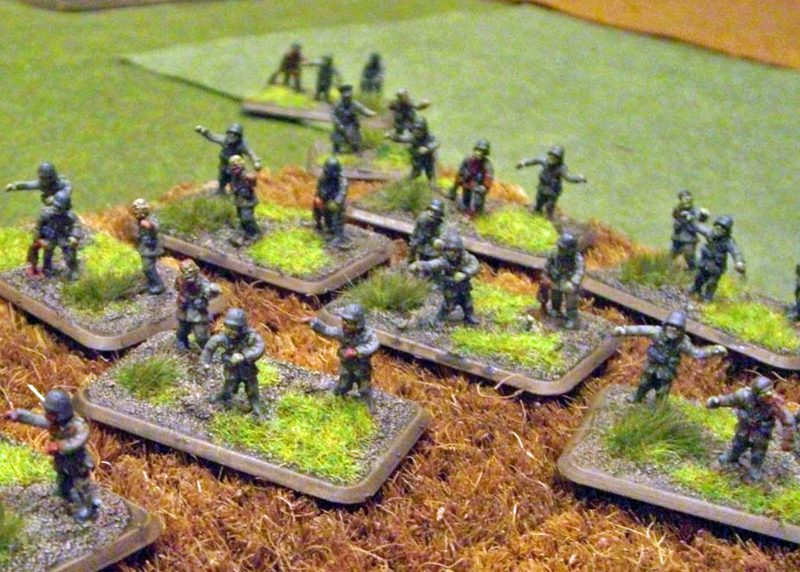 I previously shared my attempts to make a JNA (Yugoslavian) force for Team Yankee (using the rules for the East Germans). 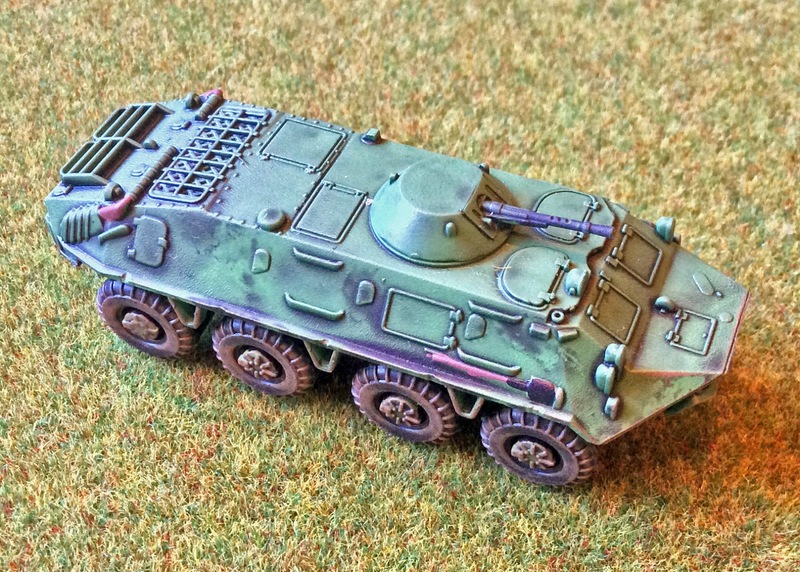 I recently completed the 15 BTR-60s, including a model to act as a command model. The BTR-60 transports are from Battlefront Miniatures. 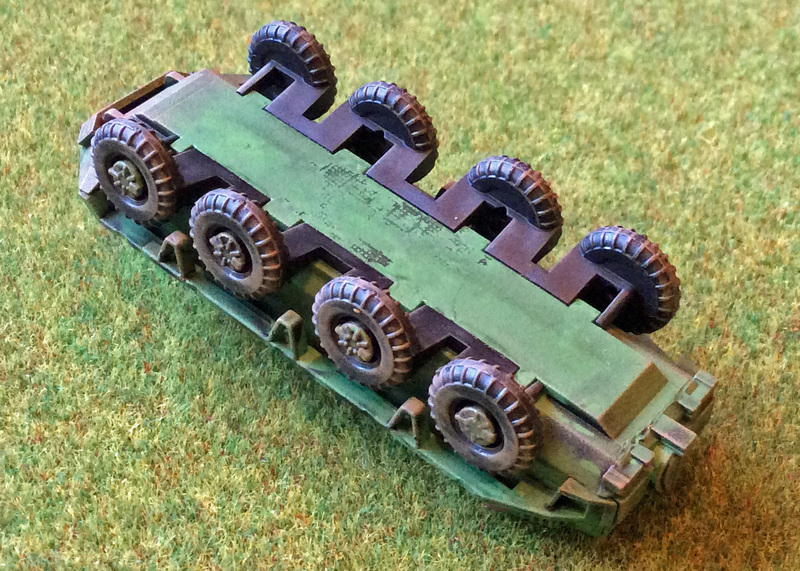 I primed them with Goblin Green from Army Painter, but primed the wheels black before gluing them on. Army Painter Dark Tone was used to mute the bright green. I painted on the details before lightly drybrushing on dust and dirt using a light brown color. Only two BTR-60PB were acquired by the JNA (for trial purposes) in 1967, and it was never adopted. A certain number of BTR-60PU was acquired with SA-9 Gaskin system as battery command vehicle. 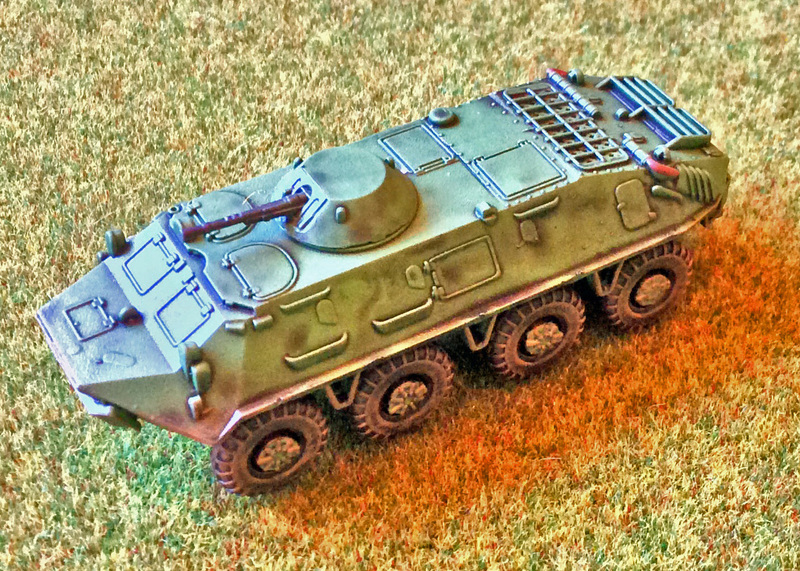 Another vehicle, TAB-71 (a Romanian-made variant of BTR-60 with the petrol engine) was accepted for service in 1976, but exclusively for military and civil police forces. They were known as very unreliable vehicles for a myriad of reasons (including apparently low mileage per year and lack of purposely trained drivers) and MP vehicles were gradually cascaded down to federal and later republic police forces. 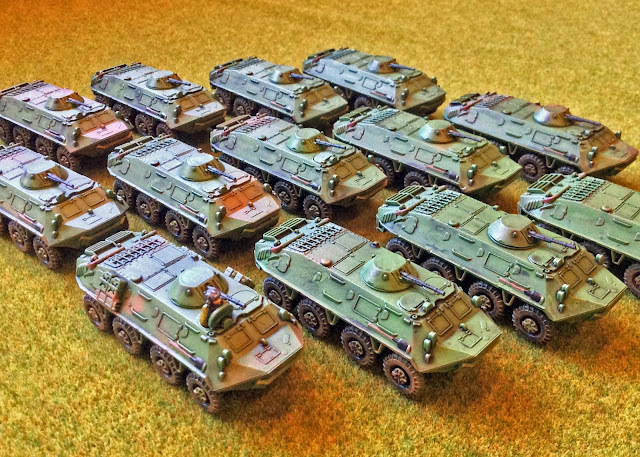 While a total of 119 TAB-71 were brought, an operative number (including Soviet-made BTR-60PU) in the late 1980s was only around 60 vehicles. First JNA unit to receive them was the 282nd Military Police Battalion of Federal Secretariat for National Defense, which was also characteristic for having 20 vehicles in total, in the first and second company. Other seven MP battalions (in Belgrade, Nish, Skoplje, Zagreb, Ljubljana, Split and Sarajevo) included one TAB-71 company, each with 10 vehicles. There was also 99th Military Company, subordinated to Air Force and Air Defence HQ, with 3 vehicles in a single platoon. The rest went to police and Ministry of Interior forces. 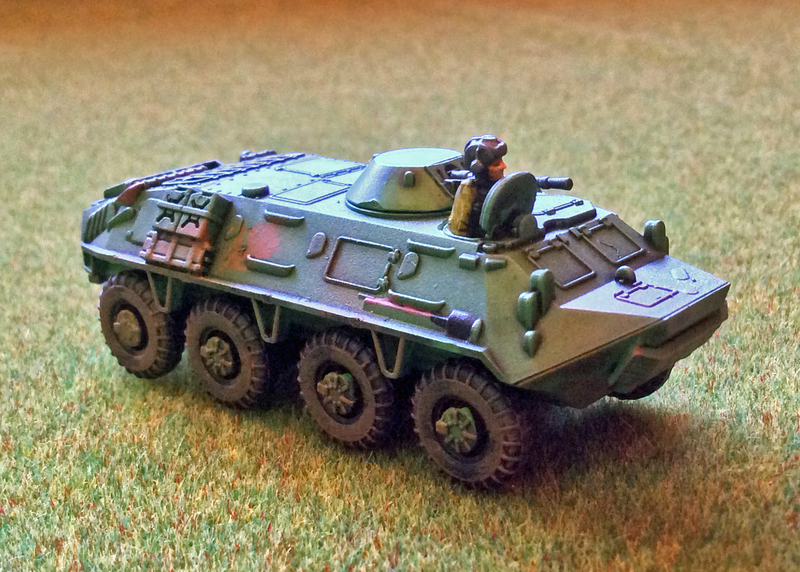 Army vehicles were gradually cascaded, and their role was taken by BOV M-86 armoured vehicle from 1986-1987. They were intended for mostly for internal and police tasks, like security, riot control etc. 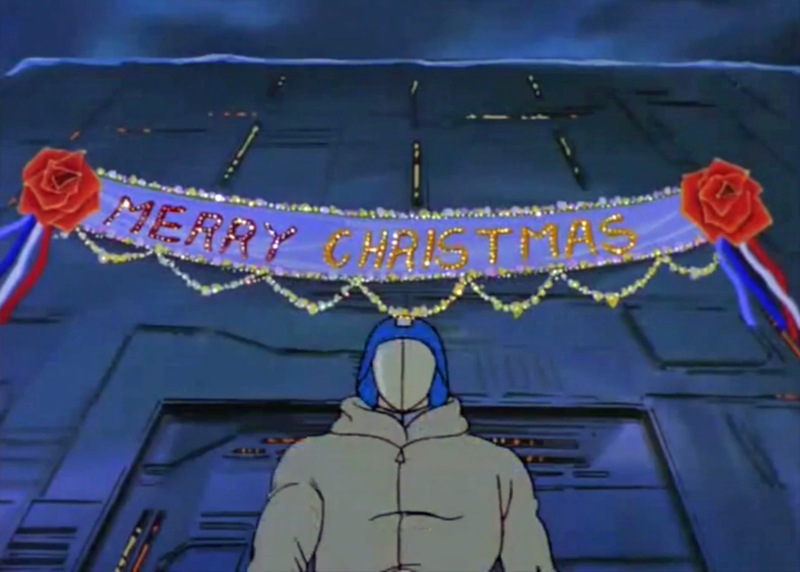 Proud to be a member of the TGN Blog Network! Star Wars: Legion - Leak of (Commander) Leia Organa and Rebel Fleet Troopers!